Liverpool will play Real Madrid in the Champions League final after a 4-2 defeat against Roma in the second leg of their semi-final secured a 7-6 aggregate win. Goals from Sadio Mane and Gini Wijnaldum saw the visitors go ahead twice at the Stadio Olimpico in the first half, with a James Milner own goal sandwiched in between. Edin Dzeko equalised early in the second half and although Radja Nainggolan scored two late goals for Roma, it wasn't enough. Despite early pressure from the home side, Liverpool struck first. A lax pass in midfield from Nainggolan was picked off by Roberto Firmino, who played in Mane on the left side of the box. The attacker showed far greater composure than when faced with a similar chance in the first leg, and finished calmly to the net. Liverpool's lead didn't last long, however, and they conceded in almost comical circumstances. Dejan Lovren tried to wallop a Roma cross away, only for the ball to rebound off Milner's head and fly into the net. Roma had the better of the exchanges thereafter but Liverpool found themselves in front again after further loose defending 25 minutes in. 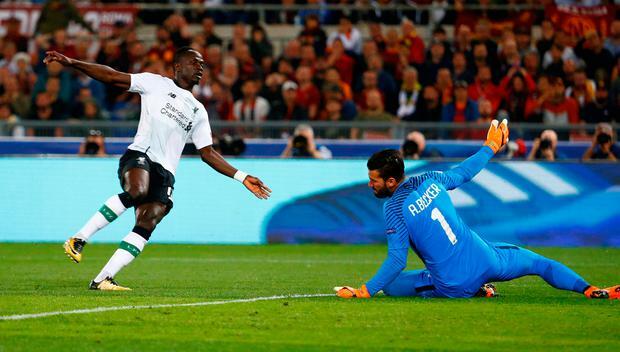 Roma failed to deal with a corner and Wijnaldum was able to nudge the ball past the on-rushing Alisson after a second cross into the area. The fans in the Stadio Olimpico were up in arms in the second half after Trent Alexander-Arnold's handball went unpunished in a goal-mouth scramble, and Dzeko also had numerous chances to put further pressure on Liverpool. However, Jurgen Klopp's side held out and will now face three in-a-row chasing Real Madrid in the Champions League final in Kiev on May 26. Jack Rathborn Uefa have confirmed the dates for the Champions League semi-finals. Tom Kershaw Pep Guardiola has claimed that Fernando Llorente’s "cruel" decisive late winner that sent Tottenham through to the Champions League semi-finals could have been disallowed for handball.